Boy oh boy, Queensland is heating up! As the temperature continues to climb, we say goodbye to the cool Winter months and hello to the heat of Summer. The heat can help you deal with the heat. Mind blown, right? Some of us find the summer heat to be unbearable, which is exactly why we should jump into a hot yoga class. Practicing in the hot room during these warm summer months can help you acclimatise to the heat outside the room. You will also find that even though it’s hot, your mind will remain cool, calm and collected, inside and outside the room. You’ll see more benefits in your practice. With temperatures pretty much being the same inside the room and outside the room, you’ll warm up faster when you get into the hot room. Meaning that you’ll jump straight into the benefits that those first few postures will bring – plus you’ll stretch longer, further and deeper into poses. It’s not hard to feel frazzled, fried and fed up in the warmer months, both mentally and physically. Ironically enough though, the heat outside the hot room drains us whilst the heat inside the hot room combined with the 27 amazing yoga postures ENERGISES us! Your good habits will flourish. We know that being well hydrated for hot yoga is really beneficial to our practice. This sets you up perfectly to continue hydrating and replenishing electrolytes outside of the room, helping you feel fuller for longer! Less sleeping in, more yoga-ing. If you’re not a stereotypical “early bird”, then the winter months can be a struggle – it’s dark outside, it’s cold outside, why would you get out of a warm, comfy bed to go to a hot yoga class? Summer brings us sun – lots of it and early! Switch your yoga routine to morning classes to energise your day. The summer heat also brings with it the party season! The hot yoga is fantastic for flushing out those nasty toxins that seem to make their way back into our bodies over the hot months. Sweat out the alcohol, sugar and processed foods to make sure you stay in top shape over summer! You’ll be ready for summer! 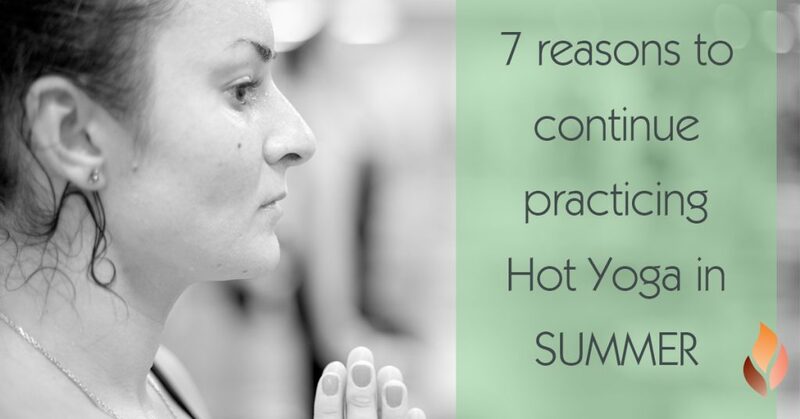 With a steady hot yoga practice, you’ll feel confident and happy within yourself this summer!